May 7 - Roading Update - Wiley went out roading today like usual and I rode him along with the hounds. Unfortunately right before we got back to the kennels the hounds broke. There were other nervous horses and running hounds and whip cracking, but Wiley just watched it all with interest. Some hounds came right back, but our huntsman commandeered Wiley to go search out the others. 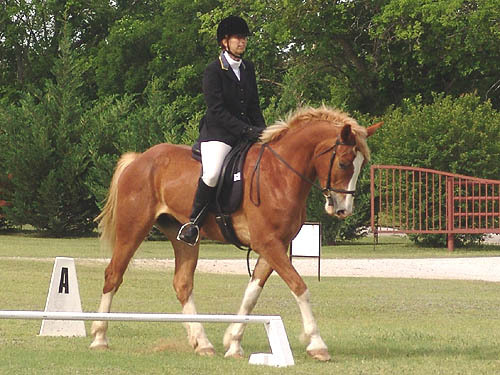 He cantered away down the road, leaving the other horses behind, with Chrissie blowing the horn off of him. He did neigh a few times, but he went around the woods and stood while Chrissie blew in the hounds. 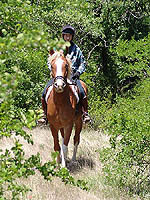 April 30 -Trail Ride Update - Well, we had a great day for a trail ride out at the hunt property. A cool day, so most of the horses were a bit up, but for the end of April it was perfect. 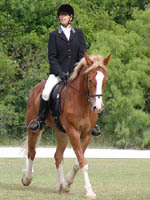 Christina rode Wiley and ended up leading the group (I guess she's just used to being out front being the huntsman). Wiley was a champ. A bit excited to see all the horses out and feeling fresh. Christina saw no need for lunging and just hopped up and started out. They got all the gates, so he got a lot of practice standing for mounting. He handled the rough terrain fine barefoot; there was no spooking in the woods, and he didn't do anything silly. He did need a lead over his first water crossing, but he calmly walked over any logs and navigated up and down the ravines. Afterwards he was happy to tie at the trailers and stand while we ate and talked. With his work out at the kennels, he's starting to act like an old hand at loading and going places.